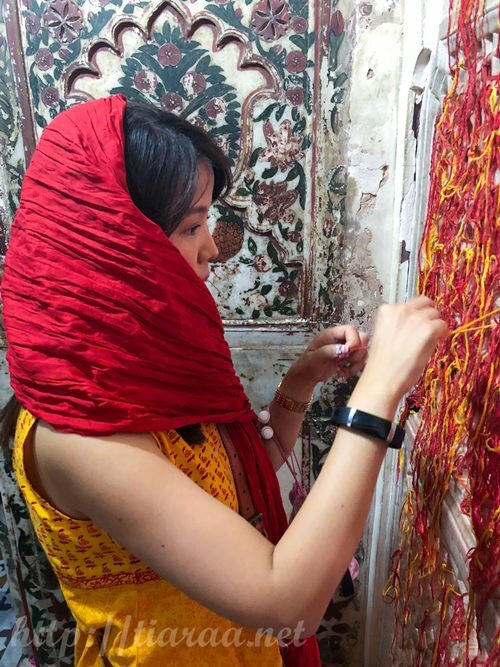 After our lovely trip to Taj Mahal, we went back to our AIRBNB to pack up before we were brought to a carpet store and marble store owned by the same person. We were actually very pissed with the complimentary guide of Agra as we did not need to buy anything from the carpet and marble factory. Yes, it was nice seeing how the things were made but we do not even have a home of our own. Thus, there is no point showing us those beautiful handmade items when we do not even need it. This will be further elaborated when I provide the cost of my India trip in another entry. 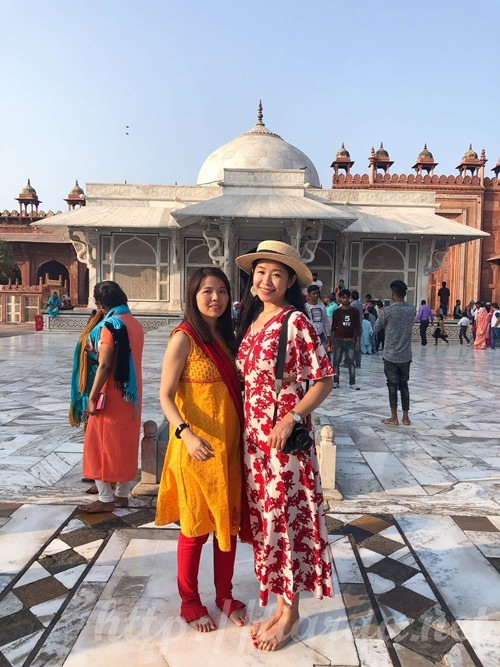 Thankfully, we stopped the guide from showing us any other stores and proceeded to Fatehpur Sikri, which was on the way from Agra to Jaipur, the next city we will be heading to. To top things up, we had a very unauthentic Indian buffet for lunch (far from from our AIRBNB’s dinner the night before), which will be shown and explained in another entry. 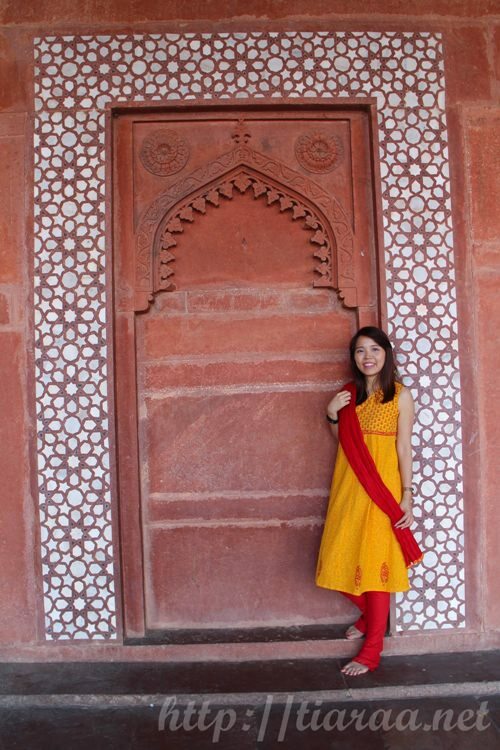 However, upon reaching the carpark outside Fatehpur Sikri, our moods changed. 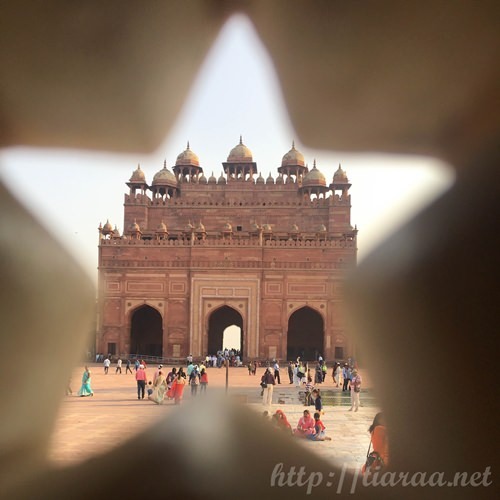 Our complimentary guide for Fatehpur Sikri greeted us with warmth. 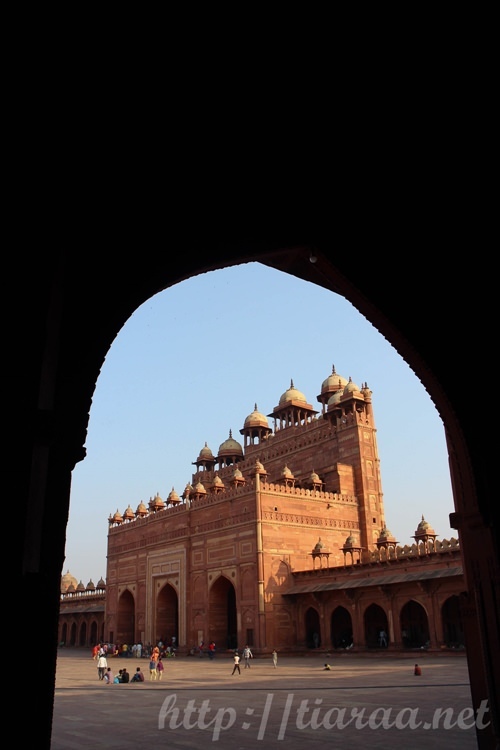 Prior to entering Fatehpur Sikri, our guide kept warning us to be careful of our valuables . He got us the entrance tickets and shuttle bus tickets, which cost 500 INR (SGD$10.42) and 20 INR (SGD$0.42) per pax. 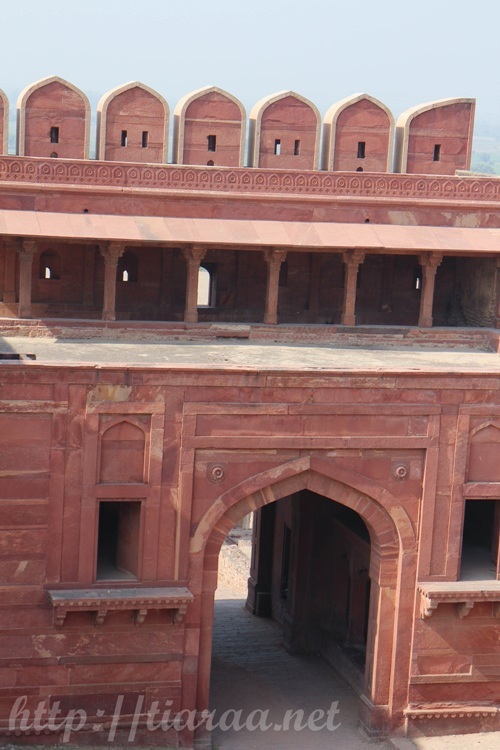 Apparently, it is quite difficult to drive to the entrance of Fatehpur Sikri as group of men will flung themselves to your car. 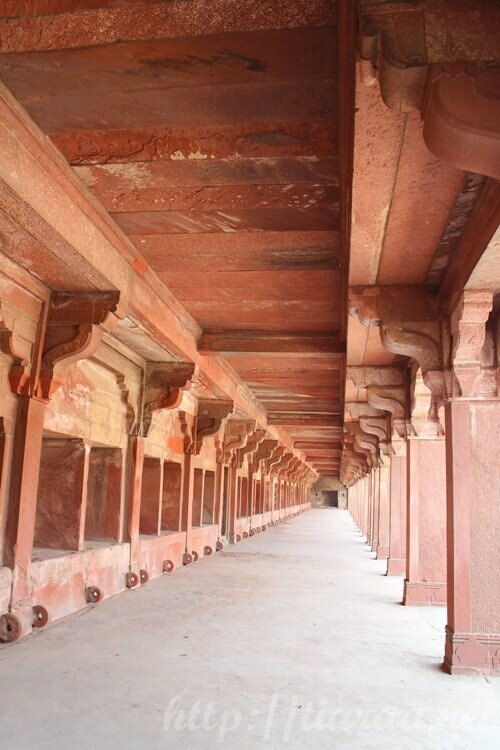 Instead, you have to take a government mini bus to the entrance of Fatehpur Sikri. The mini bus has to be extremely full (ie. People are even standing in the bus) before the bus will take off to the entrance. 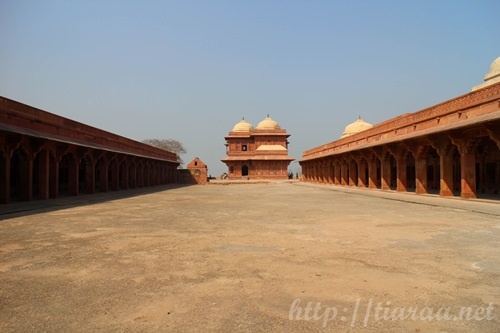 When we arrived at the Fatehpur fort, we felt peaceful as there were no touts after us and not many tourists either. 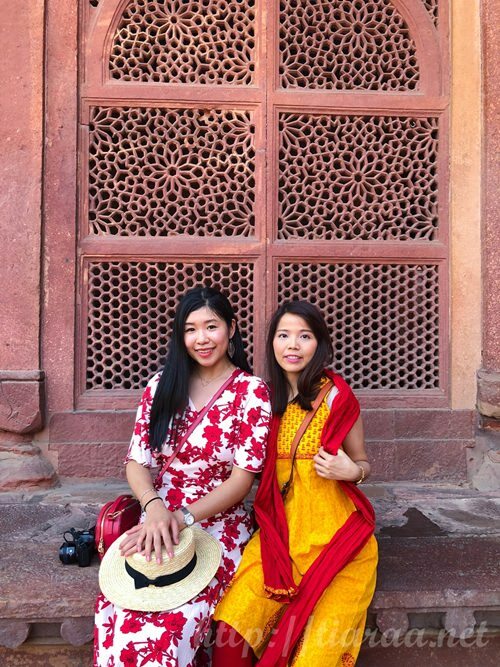 We could listen to our guide’s detailed explanation of the essential monuments in the city. This could be because admission tickets are required in order to enter the “Fatephur” side. 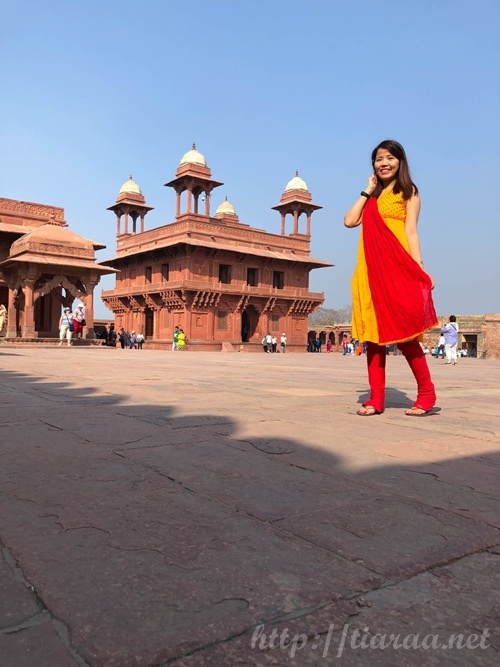 Initially, I thought Fatehpur Sikri was a monument or palace but never did I expect that this is a city! The entire complex is huge and never-ending! We were shocked when we were brought from one area to another. 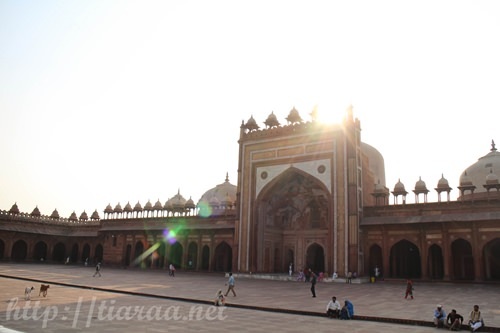 This was the city that Akbar moved his empire to and made it the capital in 1571 during the Mughal Empire. 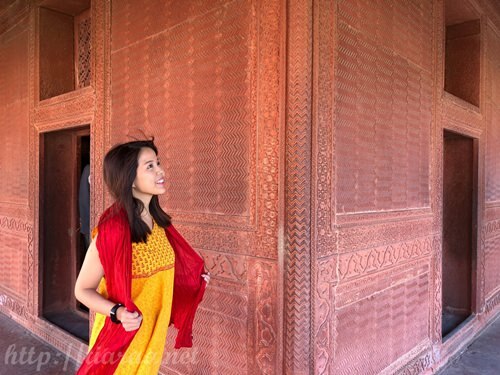 No wonder this place has been awarded as a UNESCO Heritage Site due to its rich history! The Birbal Bhavan was originally built to house Akbar’s two wives but it became the home of his courtier named Raja Birbal Bhavan after. 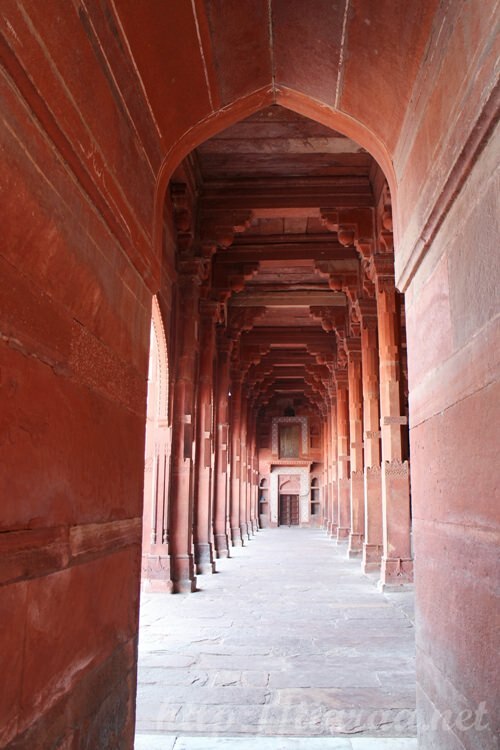 The building is designed with Mughal and Persian art and made with carved red sandstone arches and columns topped with double domed architecture in order to keep the place cool during the summer. 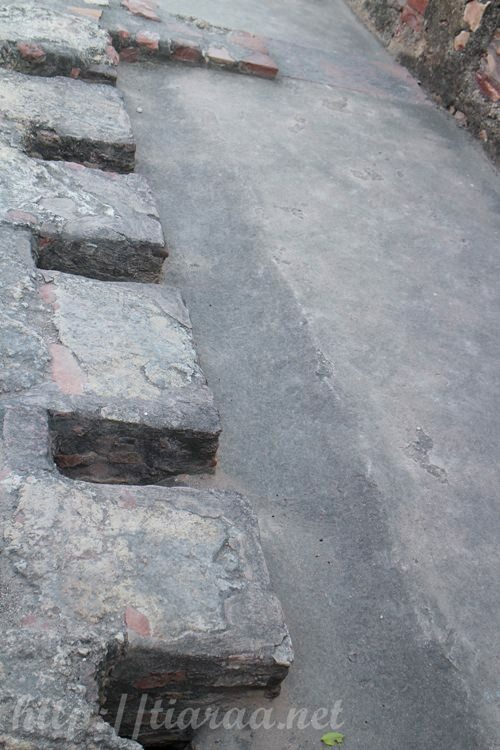 P/S: I was very surprised to know the the holes you see in the third last picture was used as toilet in the olden days. 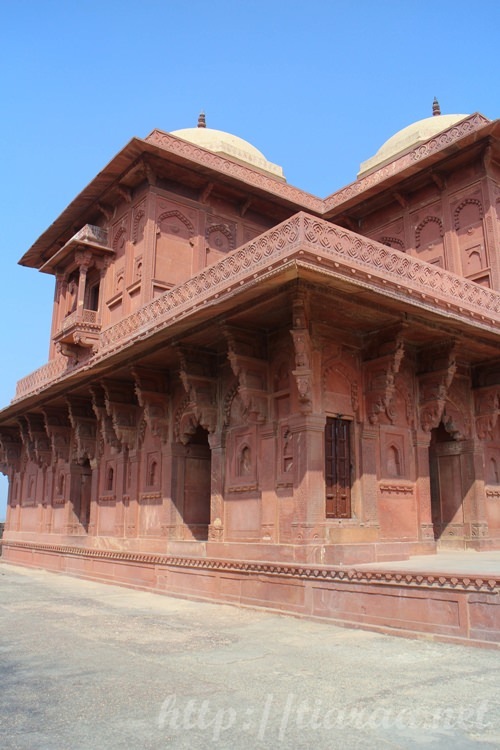 The Jodha Bai Palace was built for Akbar’s favourite queen, Jodha Bai, whom he married for diplomatic reasons in order to deal with the resistance from the Rajput kings. 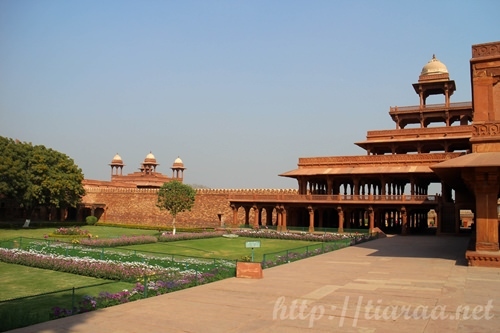 Jodha is the sister of Jaipur’s ruler, Man Singh. Hence, marrying the Rajput princess will help to build a diplomatic relationship between Akbar and the Rajput kings. 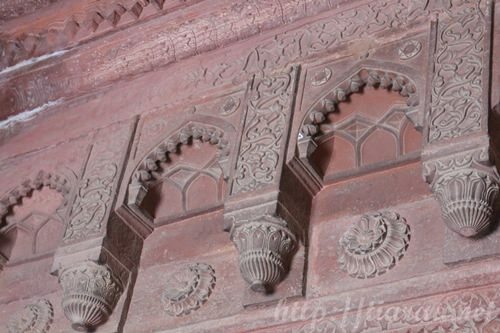 From the above pictures, you are able to see the fusion of Gujarati and Rajasthani architectural patterns and Hindu motifs such as lotus. 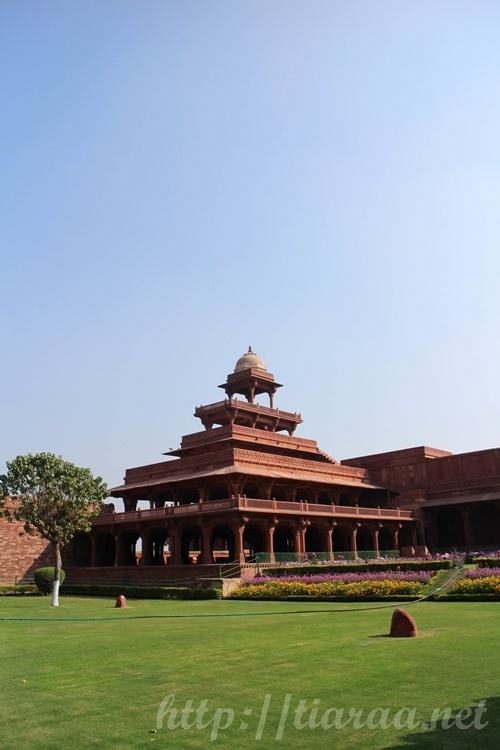 Thus, this palace allows the queen to worship her Hindu god. 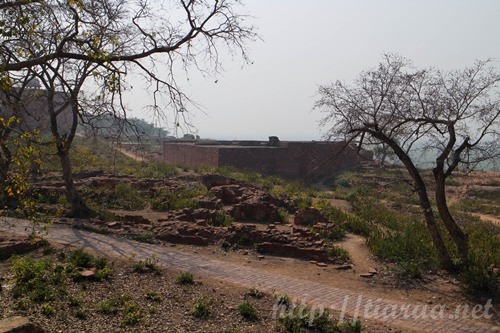 As you can see in the last picture, we could see the Hathi Pol from Jodha Bai Palace. Hathi Pol is an elephant gate as it was previously guarded with two stone elephants with a height of 3.7 metres on each side of the gate. This is the gateway to Hiran Minar (the tall cylindrical building behind the tree in the first picture), which is the elephant tower that consists of the tomb of Akbar’s favourite elephant. There is a saying that the elephants were used to trample on criminals who have been sentenced for capital punishment. 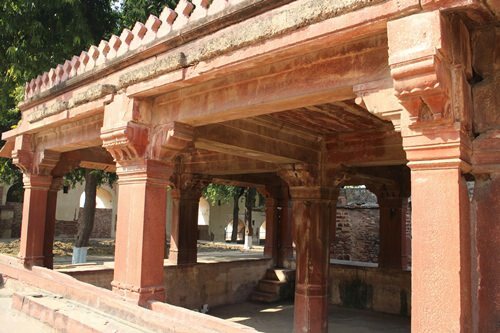 This elegant pavilion consists of a small chamber surrounded by a verandah supported on richly carved columns. 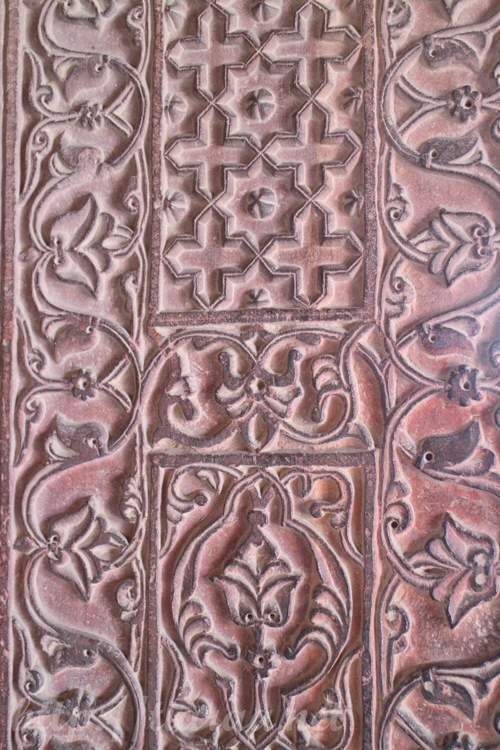 The exterior and interior has ornamental relief of geometric and floral designs in red sand stone. 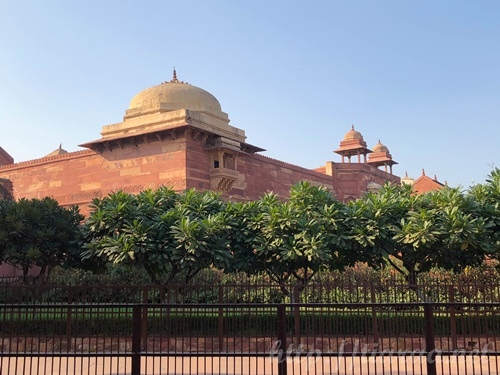 There is a debate that this pavilion either functions as the bedroom of Akbar’s Muslim wife, who is the daughter of the Turkish Sultan, or used to hold important religious discussions. 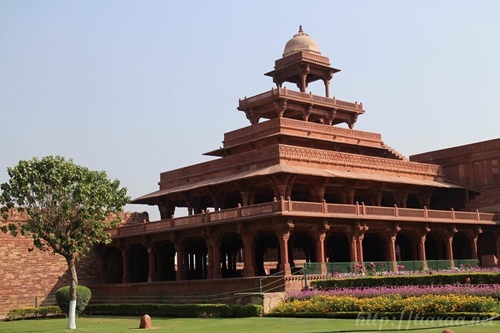 One of the most beautiful structure at Fatehpur Sikri in my eyes is none other than the Panch Mahal, which is the recreational palace and summer retreat for the queens and other ladies of the court. This explains why it is surrounded by a beautiful garden. Greenery definitely makes the area ALIVE! I was so tired from the heat and seeing red sand stone buildings one after another but when I saw the garden, I literally woke up! 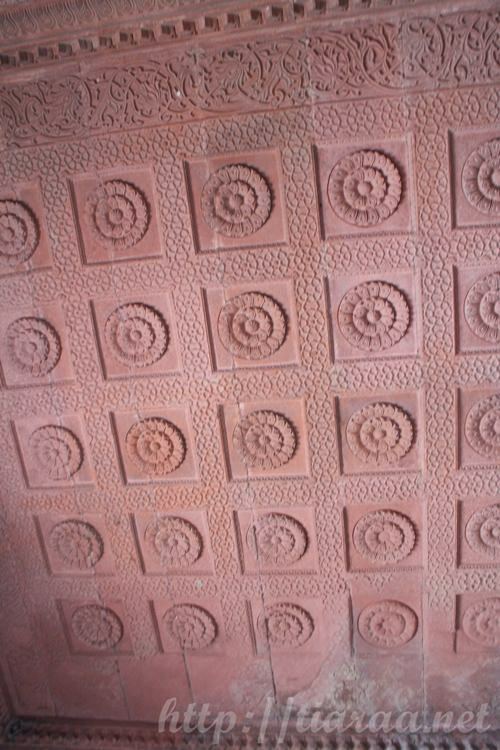 As depicted in the pictures above, the Persian columnar filled with Hindu and Jain elements comprises of five storeys of decreasing size arranged asymmetrically upon the ground floor. The queens and princesses are able to enjoy the cooling breeze on the top terraces due to the cover of the screens between the columns. 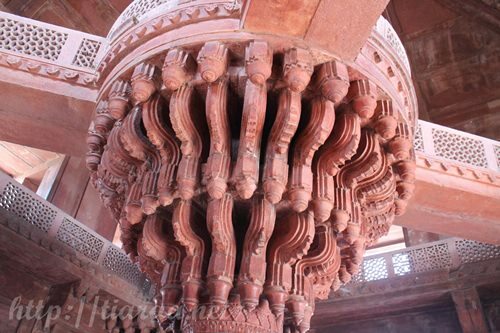 Don’t you think it resembles the architectural of a Buddhist temple as well? 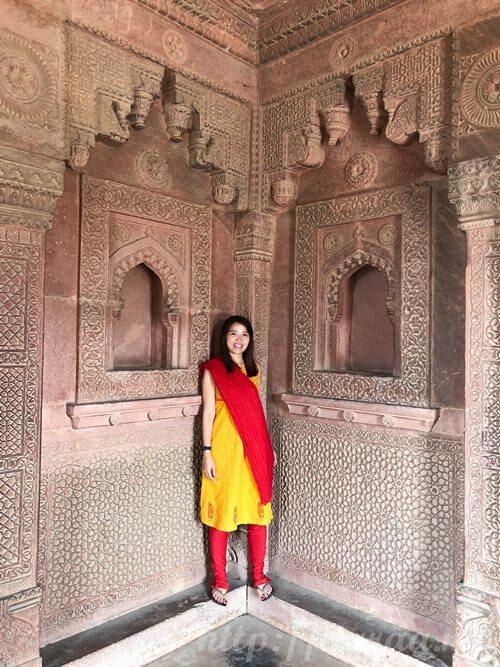 In the last picture of me posing with my kurta bought at Gurgoan, you are able to view the Diwan-i-khas at the back, which will be the next building I will be talking about. 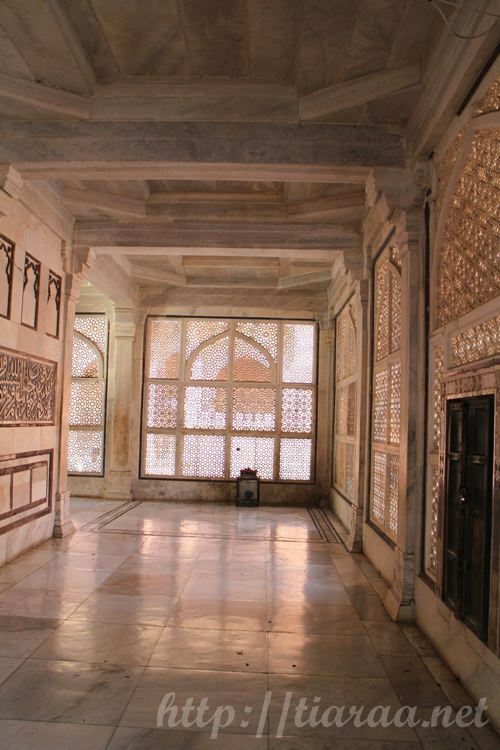 Diwan-i-khas means Hall For The Public Audiences, therefore you can see that the courtyard I am stepping on in the last picture is extensively HUGE. 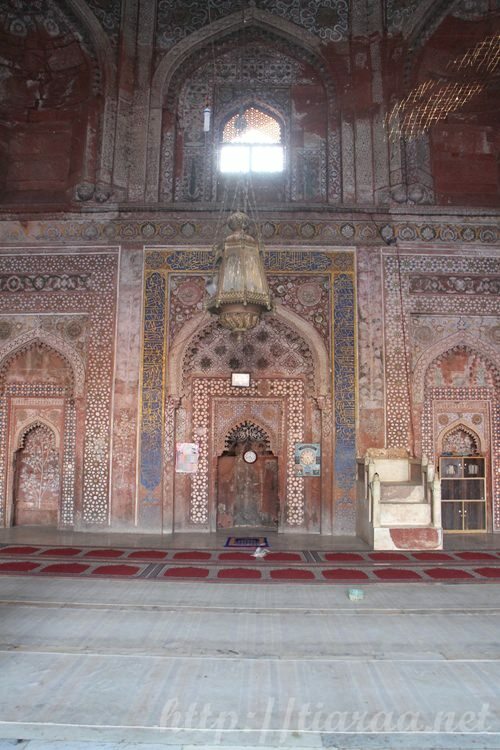 Akbar usually hear petitions and dispenses justice sternly and impartially in this hall. This was also used to review the animals of the royal stables. The first two pictures portray the lotus throne constructed 6 meters above the ground, which makes the chamber all the more majestic! 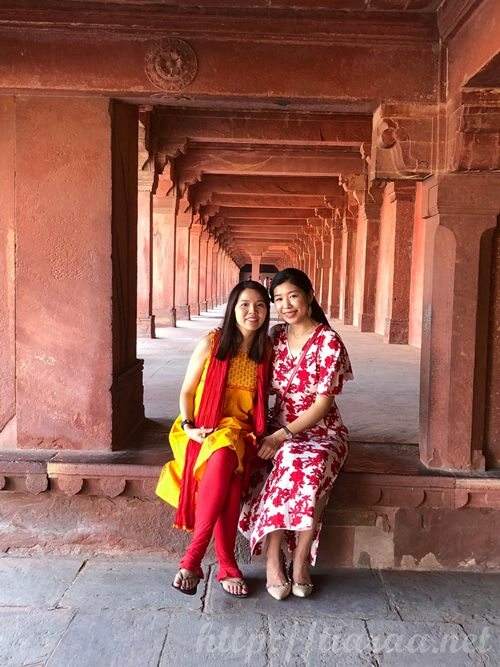 When we finally went over to the Sikri complex, you have no idea how many hawkers kept approaching us aggressively since no tickets are required to enter this area. As I mentioned earlier, I was already extremely shag due to the long walks and unforgiving heat but when scammers come along, you will be pissed to the extreme. 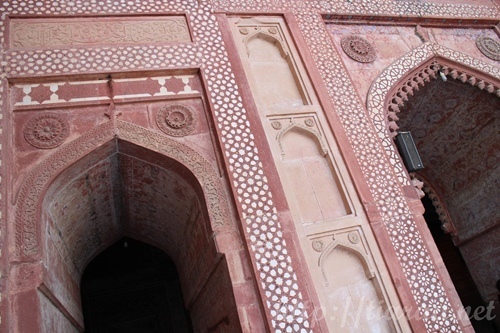 Thankfully, I resisted each one of them but this is one reason why I did not want to take a photo of the Buland Darwaza because there were gazillion people sitting on the stairs leading to the gate waiting for an opportunity to cheat the tourists or visitors. 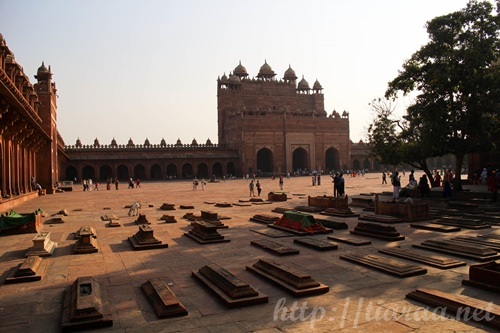 As with the above pictures, the mosque made of red sand stone is beautiful against the sunlight. 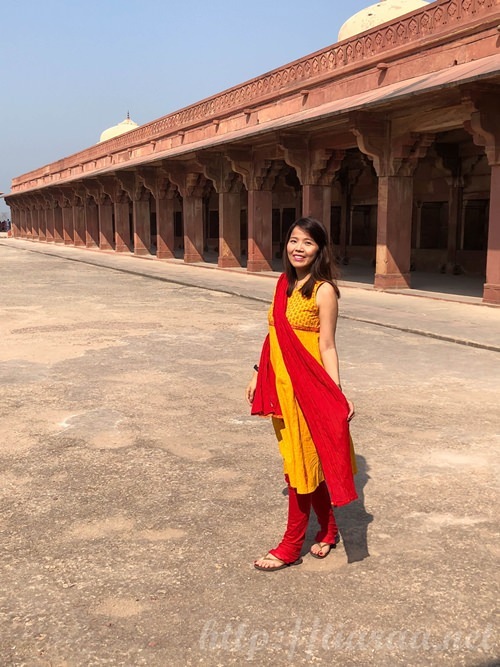 I really enjoyed viewing the meticulous workmanship of the interiors of the mosque but was very irritated being harassed by persistent beggars, especially when I am barefoot because footwear is prohibited in the complex. 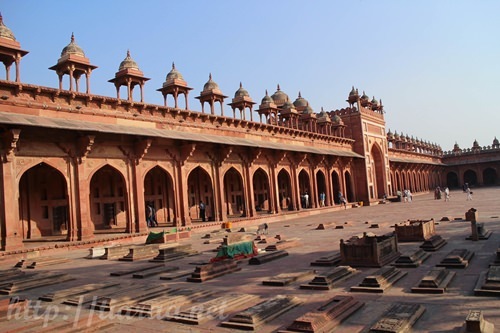 I would advise visitors of Fatehpur Sikri to treasure their tranquil time at the Fatehpur fort as it is the extreme opposite at the Sikri complex. Don’t even get me started with the Tomb of Salim Chisthti! 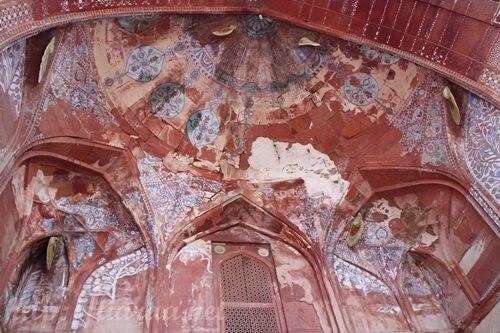 If entering the Jama Masjid already gets you annoyed, you will blow your top at the Tomb of Salim Chisthti. All along, our guide has been protecting us from the terrible hawkers attempting to sell us souvenirs and young children that were following us around. 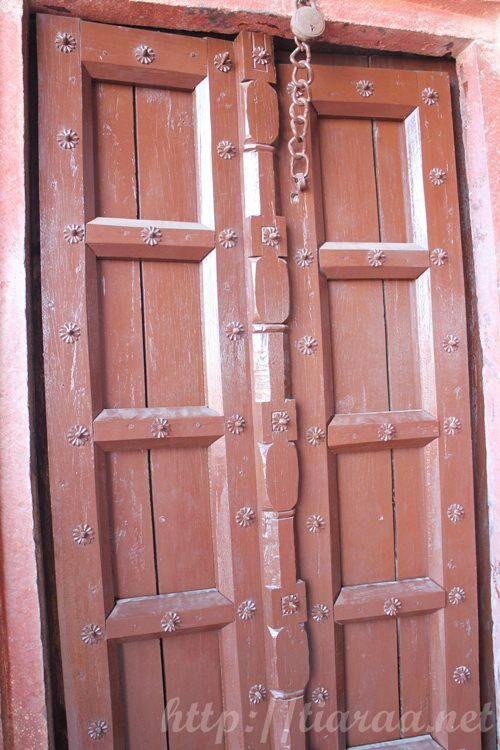 However, I am not sure why he brought us to buy chadar from the people selling it outside the Tomb of Salim Chisthi. I understand that he is an Indian Muslim but this really left a bad impression in his service as he was so good in taking photos of us, explaining the city very elaborately to us and protecting us from the buggers disturbing us but suddenly he asked us to buy the chadar so that we will receive good karma for our family. The way the sellers said were even worst! They said that the money received from our payment of the chadar will be given to the poor family and in return, we will be blessed with good fortune. 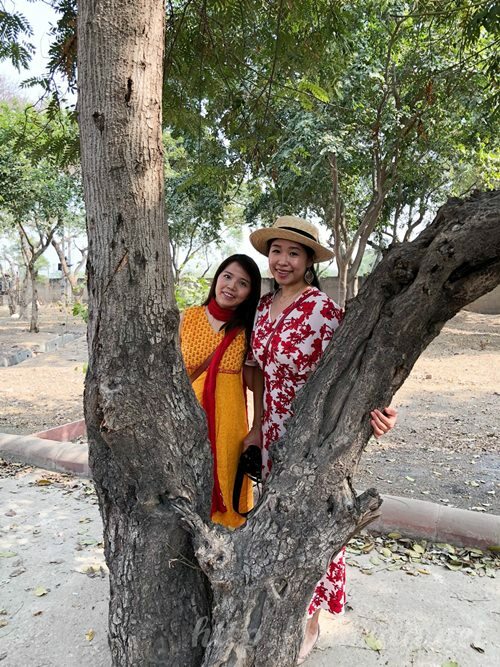 Since we were already very lethargic, both Laurie and I decided not to fight with the sellers and only get one chadar that cost 1000 INR (SGD$20.83). 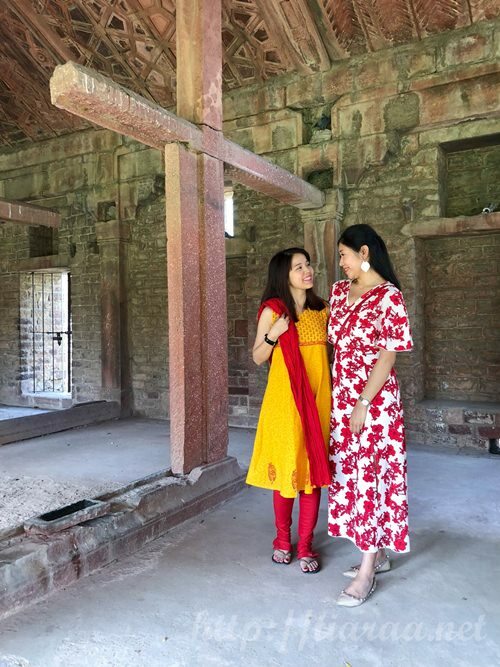 We had different preferences so of course we chose different colors at the same time and to hell with the sellers, they made us buy one chadar each because they said each person has to offer one chadar to the tomb to receive the blessings. Goodness gracious! I believe this was the ONLY scam we faced but thankfully, we came back to our respective countries safely after 10 days in India. 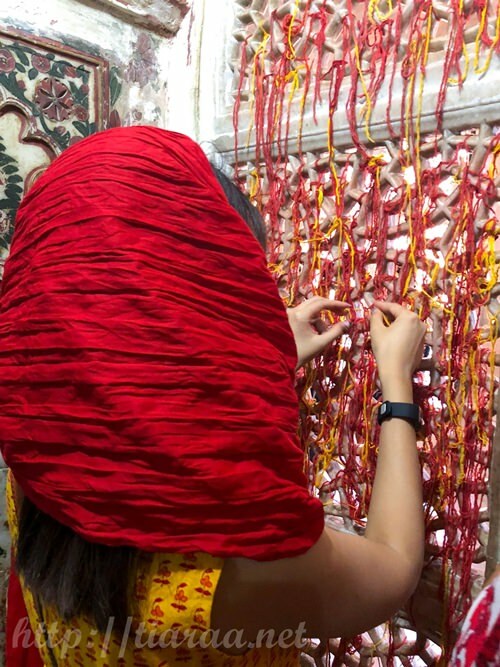 Since I was wearing sleeveless, I had to use my scarf to cover my shoulders in order to enter the tomb, place the chadar on top of the tomb and tie the threads at the wall area as shown in the above pictures. 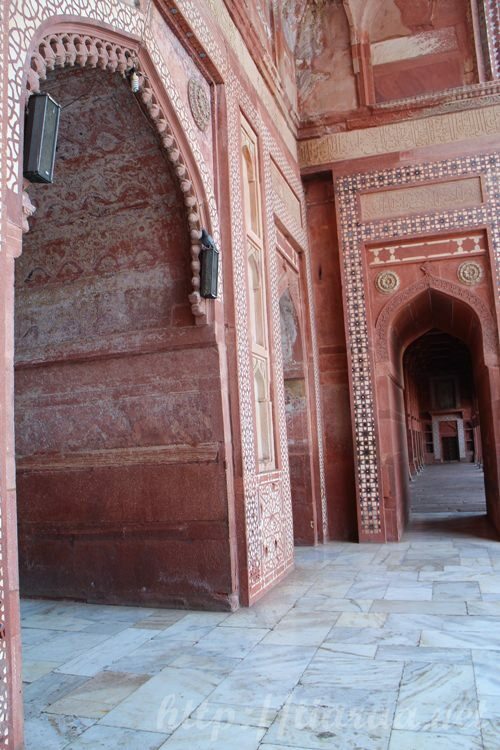 Legend has it that Akbar was heirless until he received blessings from Salim Chisti. 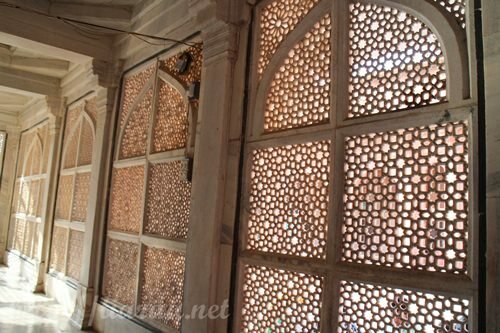 Thus, Salim Chisti has been known as a holy man since then and this building was used to house his tomb in loving memory of him. It is fine for people who have their beliefs but we do not appreciate them imposing their beliefs on us. 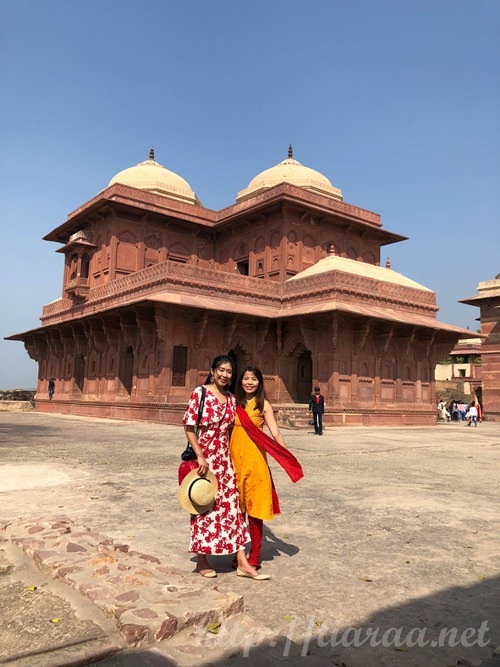 After viewing all the structures of Fatehpur Sikri and spending 2-3 hours there, it was time to head to Jaipur so we decided to take the mini bus back and retire to our car. I wanted to tip the guide only 200 INR (SGD$4.17) in total but because Laurie was very impressed with this guide’s photography skills, she decided that we should tip the guide 300 INR (SGD$6.25) altogether. Overall, he is great except for the last part, where he indirectly made us guilty in order for us to buy the chadar for offering. 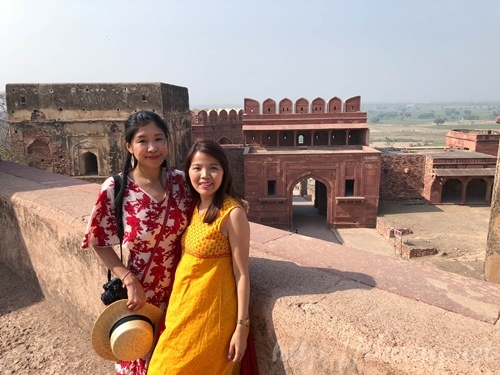 I would strongly recommend visitors to see the Sikri complext first and Fatehpur fort after so that you will find serenity at the fort after dealing with the harassment at the Sikri complex. 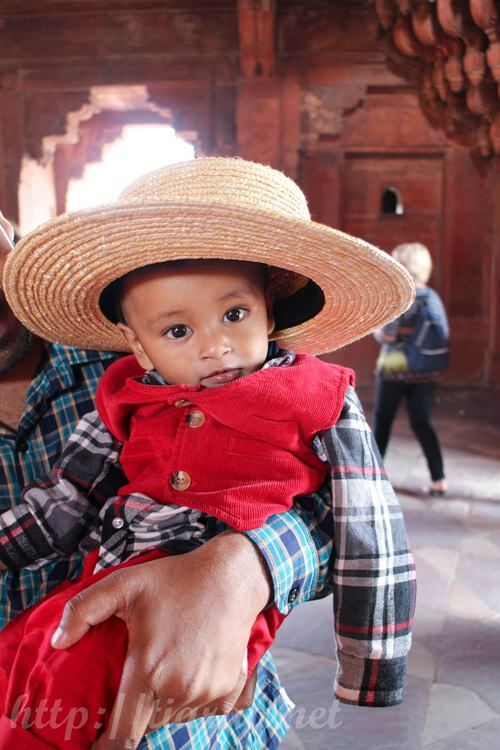 Some visitors even think it is better to skip the Sikri village altogether so that you will not have high blood pressure after. In any case, say no to anyone who approaches you no matter what your choice is.